My friend got me The Daily Mood by Fred. It’s a flip chart with a mood and picture on one side and the definition of that mood on the other. 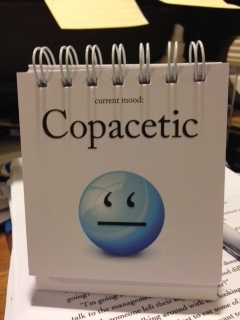 Adjective: Very satisfactory; A-OK: I’m pretty sure copacetic is a made-up word. Copacetic may have originated from African American slang in the late 19th century. It is used almost exclusively in North America, and is said to have been first widely publicized in communications between the astronauts and Mission Control of the Apollo Program in the 1960’s. I thought Copacetic was a new dance club. He said it was copacetic but really it was fubar. This flip chart makes me very, very happy, but I don’t think I use it right. I think I’m supposed to find the mood I’m currently in. 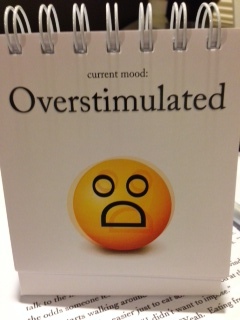 Instead, I use it more as a Magic 8 ball to TELL me my mood. First thing in the morning, I grab the flip chart, randomly open it and whatever mood it lands on is the mood I’ll be that day. Adjective; 1. Excessively stimulated; too much external stimuli: I had to stop shopping at the gourmet grocery store because it always overstimulated me to the point of wiping out my checking. Sensory overload is a condition where one or more of the five senses are strained and it becomes difficult to focus on the task at hand. -A 180 lb. person could drink 153.56 Red Bulls before pushing the daisies. Now if you’ll excuse me, I’m going to listen to my iPod while watching TV while writing my next post after drinking a safe 5 Red Bulls.